You may not want to do it, but eventually you will be in a situation where you will have to. A series of antibiotics need to be given to an injured horse or a horse that is nervous may have to be sedated before you can clip or shoe him. A well-education owner should know how to use the injection form of medications since many come in this form such as vaccinations, tranquilizers, antibiotics, anti-inflammatory medications and analgesics. Many prefer that veterinarians do the routine vaccinations and you should always consult a veterinarian before administering any drugs to a horse, although an owner may be faced with a time when they have to give the horse the injection themselves. There are four ways that an injection can be administered: intradermally which is within the skin, subcutaneously which is under the skin, intramuscularly which is in the muscle and intravenously which is in the vein. Allergy testing and some vaccines typically use an intradermal injection in horses. A higher level of skill and experience is needed for intravenous injections which is why many owners prefer to limit their administration of medications to the easier and less risky intramuscular methods of administration. There is risk with any type of injection which is why it is important to learn how to do them properly. A patient and tolerant horse is the best to practice on when learning and the best person to instruct you in the proper methods is a veterinarian. Ask your vet about the best sites for intramuscular injection sites on the neck and the vertical part of the upper hind leg so that you can identify them later when you need them. Injections should be kept near the gaskin on the hind leg to avoid scarring the muscle. The top of the hip should never be used for any type of shot. Abscesses may form in this area even though the muscle mass in this area is large and seems like an easy area. This area is generally hard to clear up since the only place to drain is into the horse. You veterinarian should also show you how to properly load a syringe and give the horse the injection. A one and a half inch needle is typically used to give intramuscular injections allow the dosage will determine the final size of the needle. You may not have to prepare the site with an alcohol swab if you have a reasonably clean horse, but it is generally a good idea to do so. The needle should be inserted up to the hub to ensure it is deep into the muscle. You should pull the plunger back first to make sure there is no blood that is drawn into the syringe before you depress the plunger. If there is blood in the syringe then you should withdraw the needle and reinsert it away from the blood vessel. Before depressing the plunger you should check again. Some substances should only be injected intramuscularly which is why it is always important to check, seizures can be caused by a mistake and the horse may even be killed. You should always discard used needles and syringes unless you are going to sterilize them. Never use the same needle on a different horse in order to prevent the risk of transmitting blood borne diseases between horses. Injections will also become more uncomfortable for the horse since using sterilized needles repeatedly will make them dull. After the technique has been demonstrated by your veterinarian you should have them supervise you while you practice on a horse with a small amount of sterile saline solution. 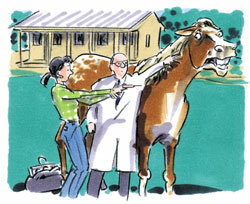 This way you will have the confidence and skin to safely give your horse an injection should it ever become necessary. Read the next horse care article on Stopping Files and Insects Bites.